One of the goals of the Museum’s 1975 Long Range Plan was the creation of a working old time blacksmith shop. 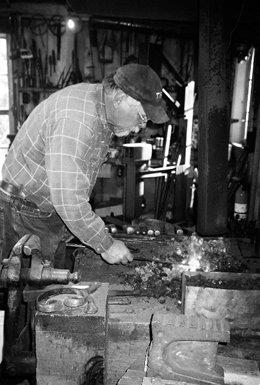 In the early years in Weaverville there were six to eight blacksmith shops in town. As the population declined and metal work became available from factory sources, the number of shops decreased. The Pioneer Blacksmith Shop was the principal blacksmith shop and originally stood on Main Street just opposite the existing old Weaverville Volunteer Fire Company’s firehouse. Benton and Armentrout first owned it in the 1870s. They built a new shop in 1885 and it eventually passed to David Davis in 1888. That building was rebuilt in 1905 following the great fire that destroyed it and most of Chinatown. David Davis’ younger brother, Griffith "Griff" Davis, came from Illinois to work at the Pioneer Blacksmith shop when David Davis died in 1908. Griff worked at the shop and became owner in 1913. He took in Johnny Hagelman as his partner, but Hagelman left in 1919. Griff carried on as smithy until he died in 1936. In 1937 the building was dismantled. 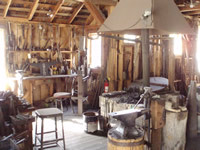 The creation of a working old time tin shop was included in the Museum’s 1975 Long Range Plan, along with the blacksmith shop. The antique equipment was installed and operational in 1989. It is now used by our own tinsmiths in demonstrating the use of the tools to school tours, bus tours and to the general public during the Saturdays of three-day weekends and on the 4th of July. The Tin Shop occupies the right-hand side of the same building which houses the blacksmith shop. This pioneer shop was inspired by Max Lang’s Tin Shop with the support of his descendants. Lang also operated a general merchandise store for about 30 years in the brick building that still stands at the northeast corner of Main Street and Highway 3 in Weaverville. Max Lang’s Tin Shop was originally located across Main Street from his store. When Max Lang retired, he sold his shop to Ann Whitebread. It changed from owner to owner and smith to smith through the years. As this project developed, it was discovered that Hal Goodyear was in possession of a treasured collection of tin smithing equipment that descended to him from his grandfather and uncle’s partnership, Miller & Goodyear. Many of the machines in the shop were manufactured by companies that had gone out of business by 1870. It is very likely that Max Lang, and other tinsmiths including Whitbread, John Timmerman, H.T. Bush, and Anderline & Miller had used most of this equipment. The museum site was perfect for the duplication of the old Davis shop uptown. The building was completed in 1988, equipped and fully operational by 1989. 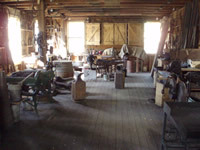 The interior of blacksmith side of the shop is set up from an old Gene Goodyear photo. The tools are not original Davis tools, but come from other pioneer shops - the old Harmon Schlomer shop in Helena (North Fork) and the Van Matre Ranch shop in Minersville, now covered by Trinity Lake. Two permanent forges are set up - one blower type and the other using bellows. Every attempt is made to retain its 1920s flavor. 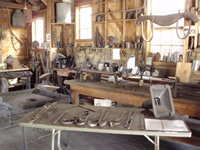 Local blacksmiths use the replicated shop to produce items for sale in the Museum’s Gift Shop and for live demonstrations for school tours, bus tours and on holiday weekends. 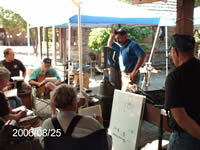 Blacksmithing classes are taught under the sponsorship of the California Blacksmith Association. 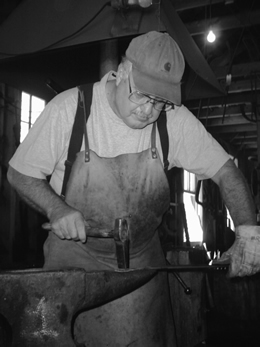 Classes are conducted throughout the year in the art of blacksmithing. Senior blacksmiths teach those newer to the trade. There are several fixed and several portable forges in the shop, plenty of room. In the same building as the Blacksmiths Shop is the Tin Shop. Students may take home small momentos made in the shop. 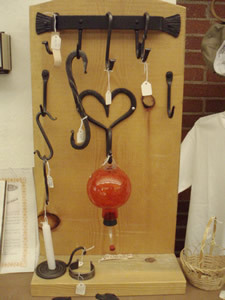 The blacksmiths offer for sale their works of art and contribue those proceeds to the museum. 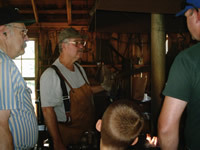 The Blacksmith Shop/Tin Shop provides tools and instruction for blacksmiths of every degree of expertise.